The data released last week generated a lot of news stories, first bad ones about the GDP numbers and then good ones about the employment numbers. When you put the numbers in perspective, however, the economic story is little changed from what we have been experiencing for several years now: a continued weak economic recovery. 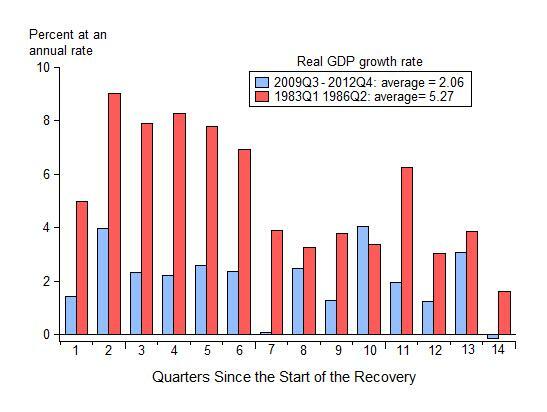 If you average out the -.1% and 3.1% growth in the third and fourth quarters, you get 1.5% growth for the second half of 2012 which is the about the same for the year as a whole, and down from 2% in 2011 and from 2.4% in 2010. Here is an update of two charts I have used in past posts to show the weak growth compared to the early 1980s recovery and compared to the economy’s potential. 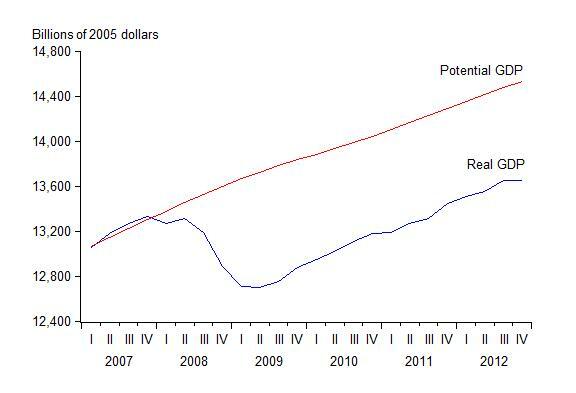 Growth is still much less than the 1980s recovery, and the gap between actual and potential GDP is not narrowing. The jobs report shows that employment growth is still barely keeping up with the growth of the population, and not nearly enough to bring labor markets to pre-recession levels. 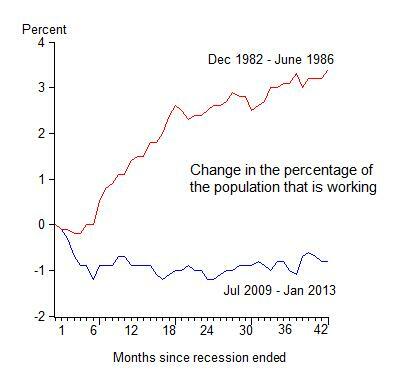 The percentage of the working age population with a job has yet to take off. Here is an update of a chart I have used in earlier posts to illustrate this. It is the same worrisome story.